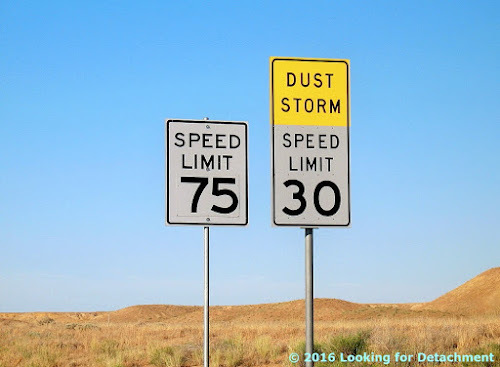 Road Sign Thursday: Dust Storm! 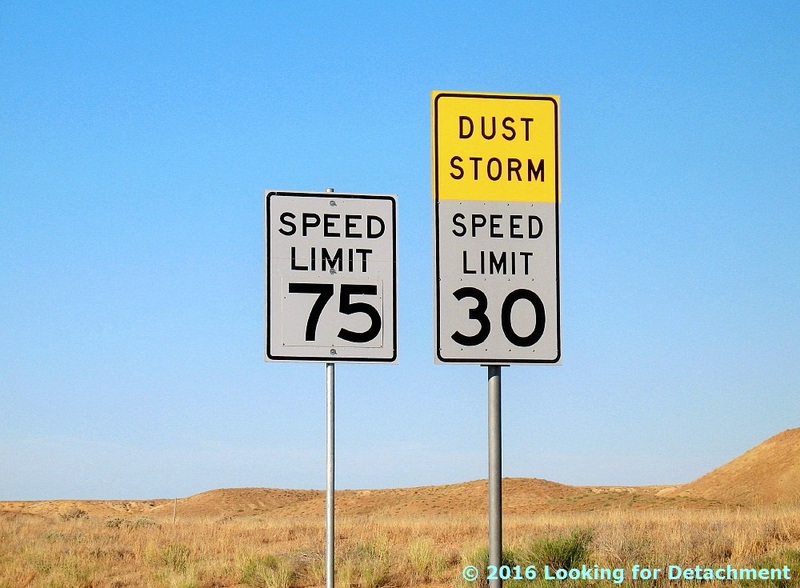 Someone at US Ends.com suggested, when posting a photo of a similar sign on eastbound I-70, that there is one speed limit for regular travelers and a second, lower speed limit for dust storms. I took this photo in 2006 on I-70 in Utah, while MOH and I were traveling in an easterly direction. The sign was located near Cisco (location way below), and it's apparently no longer there, or anyhoo it isn't shown on the current rendition of Google Street View. The Colorado River is less than 10 miles to the south of the interstate, and one happens to be driving through an upland largely underlain by Mancos Shale, which often makes paved roads lose their originally smooth surface, leaving drivers and passengers alike to feel about the same as they would while driving over bad frost heaves on the Alaskan Highway between Destruction Bay, Yukon, and Tok, Alaska. Anyway, this is my first post in an off-and-on series of Thursday road sign posts. Many of the signs I've photographed over the years are standard mileage signs, exit signs, warning signs (curves, low flying aircraft, what-have-you), regulatory signs (stop, yield, do-this, do-that), mileposts (often photographed so I'll know where a certain roadcut or outcrop was located along the road), and other signs, some of which have nothing to do with the road (Iditarod signs, pub signs, signs on and inside buildings): anywhere signs, in other words. It looks to me like you can see Quail Rock from White Pass! We've gone over White Pass—btw, here's a gigapan looking west from White Pass—and we've gone across the flats in the east fork of upper Titanothere Canyon. The road has become a fairly normal dirt road, and although it's still a little narrow, there are places to pull over, or pass, if you happen to be traveling faster than someone ahead of you—although by this point on the road, there is plenty to look at, everywhere, all around, so going slow behind someone (back far enough not to eat any of their dust) is an acceptable option. All through this section, until about the unnamed pass between the east and west forks of upper Titanothere Canyon, the age of the rock formations is Cambrian to the south and Tertiary to the north. 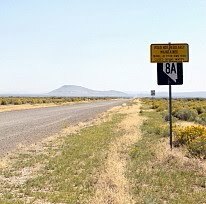 The unnamed pass is marked by "Gate" and a gate symbol on the USGS topographic map of the area (USGS TNM 2.0 Viewer)—not that I noticed a gate. The geology changes a little at the unnamed pass, and the road goes into a series of curves, while also going up and down quite a bit. We've entered the territory of the Tertiary Titus Canyon Formation. The exposures right along the road from here to Red Pass will be either Titus Canyon Formation or Cambrian formations, though not much of the latter, and none that I have photos of. This photo looks up the western branch of the western fork of upper Titanothere Canyon (Titanothere Canyon is not actually divided into forks and branches, but I've got to call them something!). A fault runs up this canyon, dropping the Tertiary section downward on the northeast (right) side. 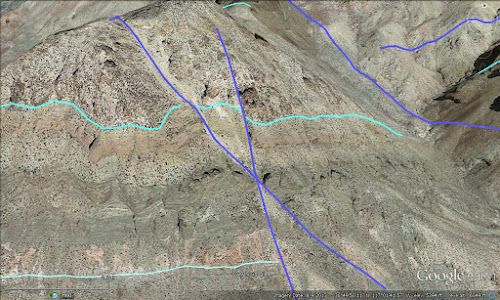 You can see the southeast-northwest trending fault in this geologic overlay I made on Google Earth (G.E.). The geology is from Niemi, 2012. Using the "Add Path" feature of G.E. creates lines that hang up in the air above the topography in places, making the contacts as drawn look a little ragged. They also disappear behind topography, going in and out unexpectedly in places, so they are best used for quick visualization. My drawing of the contacts may not be precise, as Niemi's geologic map wasn't associated with an air photo (as published, anyway), and his topo base was digitized somehow, so it doesn't correlate directly with USGS topographic maps (TNM 2.0 Viewer), which can be directly correlated with air photos. I also may have modified some contacts based on what I was seeing on the air photos (G.E.). 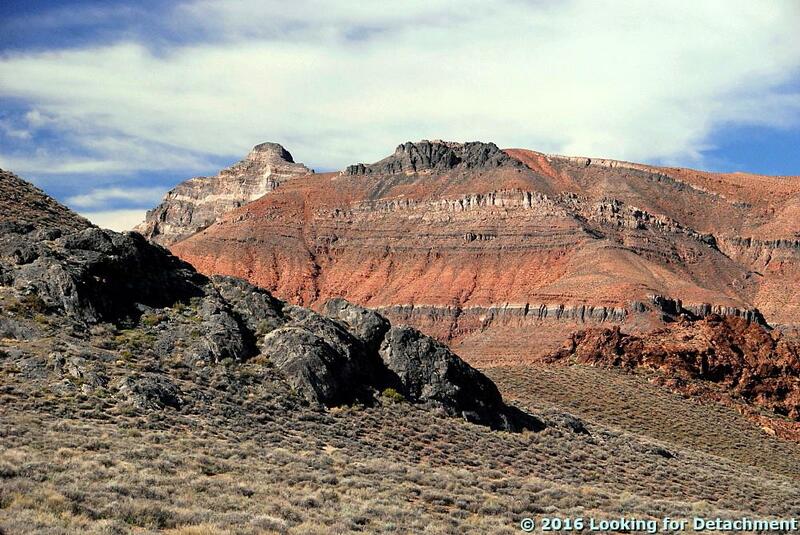 Here, above and below, we can begin to see a little of the geology, including a lot of Quaternary alluvium (Q). Notice the terraces of older alluvium, especially the nice one up the canyon. And, by the way, I use blue for faults. I've labeled the foreground units, from EOgtc to Q (Quaternary undivided). I've emphasized the southeast-northwest trending fault I mentioned earlier by thickening the blue line to the right of the little canyon we're looking up. Most of these formations were described in a little detail in my last post. 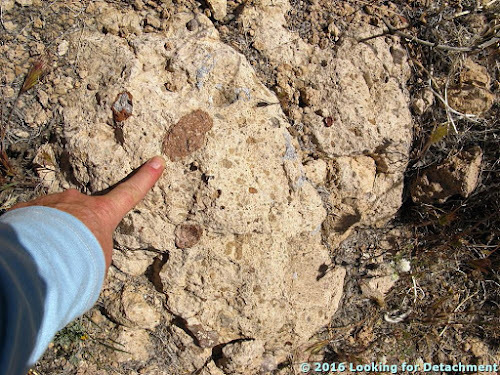 Briefly, the Trp is the Miocene Rhyolite of Picture rock, a rhyodacite to latite flow; the Tw is the Miocene Wahguyhe Formation; the Tg is the Miocene Panuga Formation; and the EOgtc is the latest Eocene to Oligocene Titus Canyon Formation. What is shown as Tg in these posts (and on Niemi's map) was once considered to be the upper part of the Titus Canyon Formation, a section known as the Green Conglomerate facies, which sits atop a disconformity on the Variegated facies of the Titus Canyon Formation, formerly considered to be the middle unit of the Titus. All that changed with the publication of Snow and Lux's Tectono-sequence stratigraphy of Tertiary rocks, California and Nevada in 1999, when the Green Conglomerate facies was assigned to the Panuga. Below, you can see the sort of thing one can work with if geologic contacts are transferred to Google Earth. 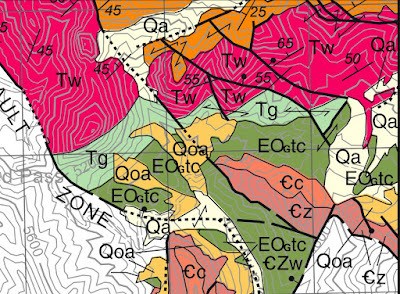 This map is a small portion of Niemi's 2012 geologic map of the central Grapevine Mountains. This image overlays Niemi's map (above) fairly well. I'm sure there is some distortion, and I didn't mean to leave my photo locations turned on!! I've extended a fault or two based on the air photo imagery in G.E. We're getting closer and closer to Red Pass. MOH and I decided to pull over in a slightly wide spot near the next curve so we could hike around a little and look at rocks. I took the next photo just before that curve, primarily to grab a shot of what appears to be an example of two normal faults forming a small, asymmetrical graben on the hill beyond the curve. Is this a small graben? A closer view of the hypothetical graben. 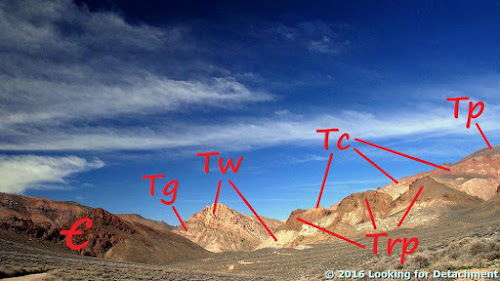 The top of the crystal tuff (xtl tuff) formerly marked the change from middle Titus Canyon Formation to upper Titus Canyon Formation. This generally greenish formation is now assigned to the Panuga Formation (Tg). Looking around from various angles on Google Earth, I have to conclude that there is definitely something going on up there, probably more than two intersecting joints, although the offset on both structures is quite small. The two hypothesized faults, as seen from a different angle thanks to G.E. 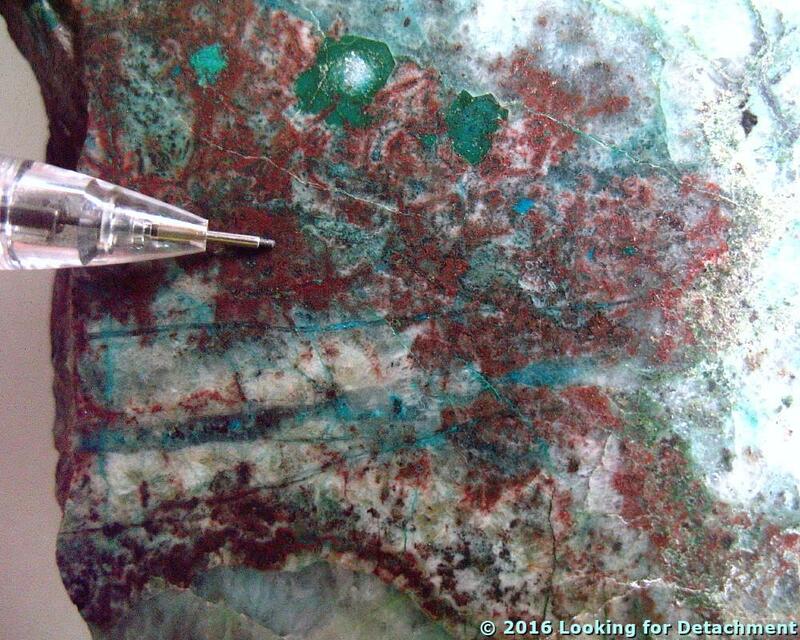 The lower, lighter cyan line marks the base of the crystal tuff seen in the last photo. The crystal tuff has been correlated with the 15.7 Ma Tuff of Unconformity Hill (Snow and Lux, 1999). A bit of the Titus Canyon Formation, I'm not sure which part. Here's a nice piece of gneiss (yes, we geologists really say things like that), a boulder that was once a rounded clast, probably in the Titus Canyon Fm, but possibly in the overlying Panuga Formation. "RUB" in Rubicon for scale. From this same spot, we get a great glimpse of our next section of road: the climb up Red Pass. We're looking in a southerly direction at the main switchback going up Red Pass. You can see why it's called Red Pass! 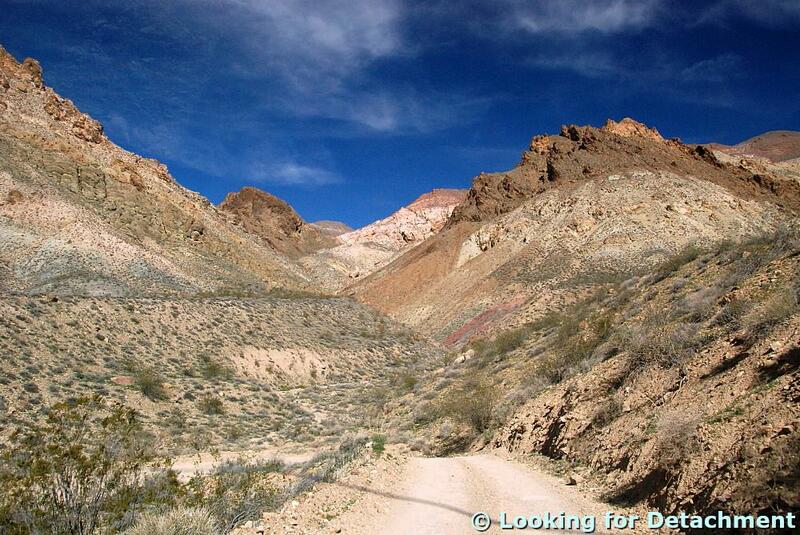 The road through here is in the Variegated facies of the Titus Canyon Formation, according to Lengner and Troxel (2008). I'll have to trust them on this. It is within the lower portion of the Variegated facies that late Eocene to early Oligocene fossils have been found (Lengner and Troxel, 2008), including the fossil Titanothere (Protitanops curryi) for which Titanothere Canyon was named. Read more about the Titanothere and other fossil finds here at Geotripper. 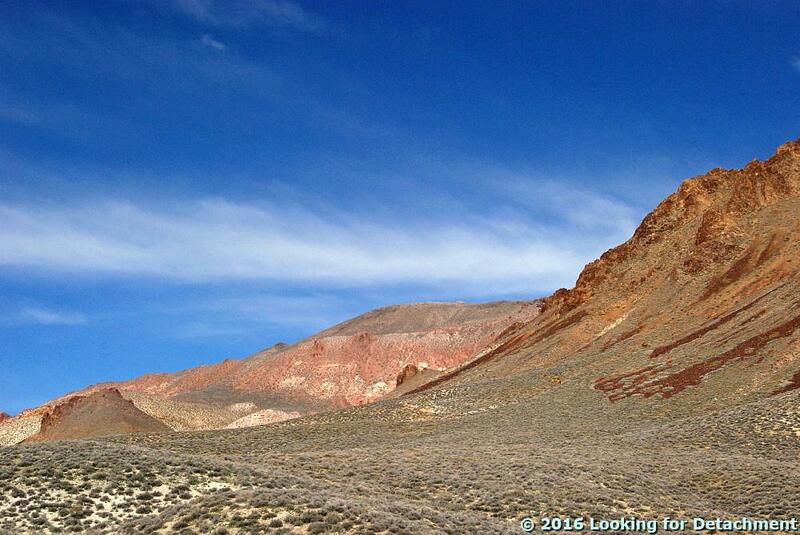 With this next photo, we've begun to climb the east side of Red Pass. We turn back around, after pulling over to the side, to see where we've been. The unnamed pass is right at that little white bit of road nearly at the center of the next photo. Just below that section of road, you see the Cambrian part of the latest piece of our journey: The jagged reddish brown rocks on the right side of the photo (south) are Cambrian Zabriskie Quartzite dipping northward (left), overlain by a thin, dark gray section of rock mapped as Cambrian Carrara Formation (although on G.E. the rock looks about the same as the Cambrian Bonanza King Formation did near White Pass). 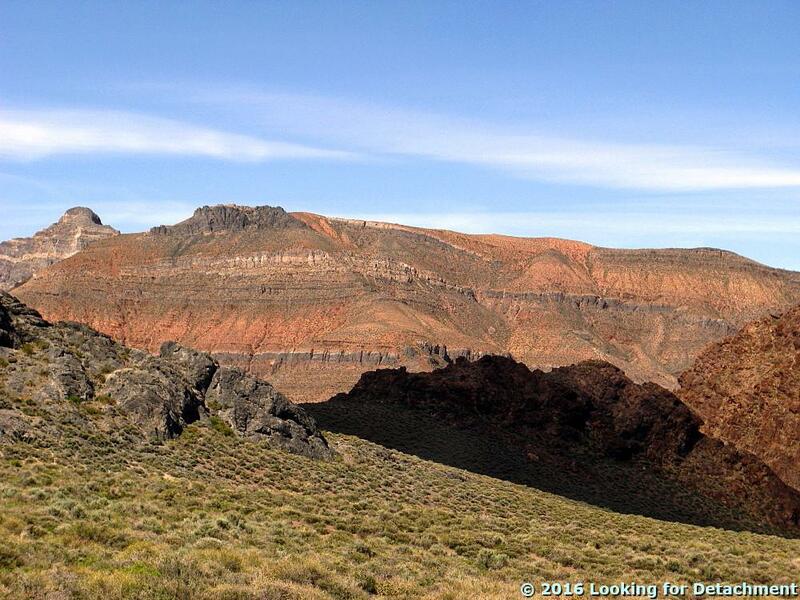 We're looking northeast into the part of upper Titanothere Canyon. With that view, we'll stop for now. We'll climb up Red Pass next time. While you're waiting, check out this great gigapan by Ron Schott, which looks like it was created at about the same spot I took the last photo. Snow, J.K., and Lux, D.R., 1999, Tectono-sequence stratigraphy of Tertiaryrocks in the Cottonwood Mountain and northern Death Valley area, Californiaand Nevada, in Wright, L.A. and Troxel, B.W. 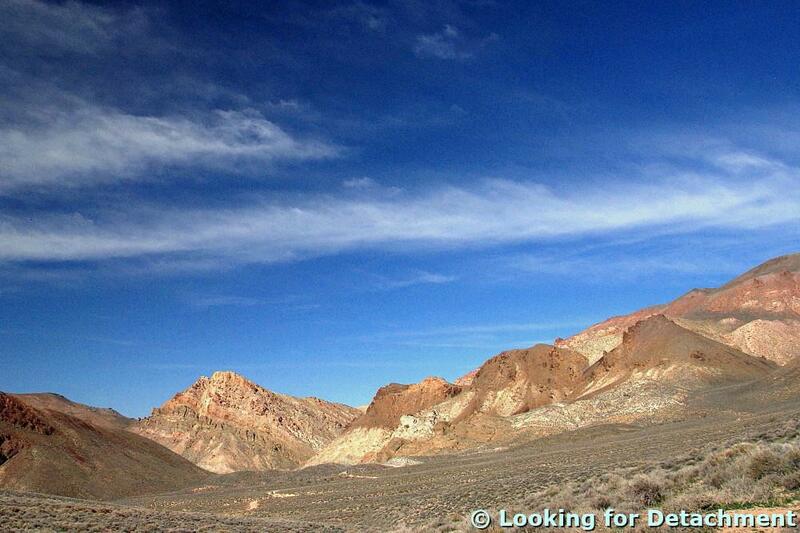 eds., Cenozoic basinsof the Death Valley region: Geological Society of America Special Paper 333, p. 17–64. On this section of our trip, we are not actually in Titus Canyon: We are in some unnamed wash that drains eastward into the northwest part of the Amargosa Desert. 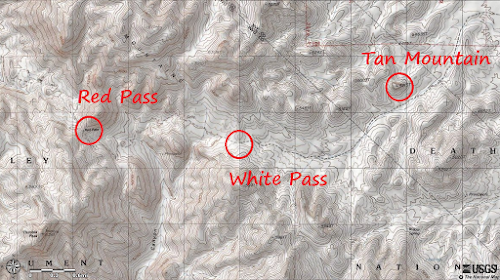 Beyond "White Pass," we will at first be in the upper reaches of Titanothere Canyon, still not in Titus Canyon. 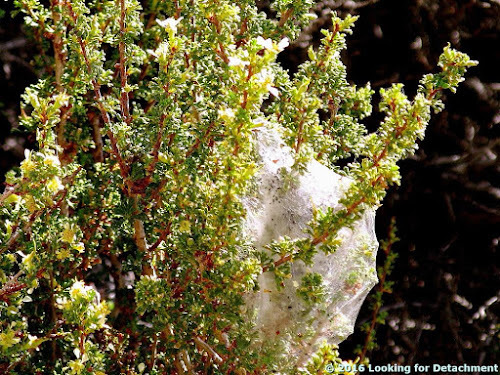 A close-up of the same bush, showing the silky, tent-like mass in its branches. I suspect this bush, growing beneath the hoodoos of Tan Mountain, is Purshia stansburyana (formerly P. stansburiana) rather than its close cousin P. tridentata—Lengner and Troxel (2008) show pictures of this bush growing along the road near Tan Mountain. It's hosting what they identify as the caterpillars of the Fotis hairstreak (Callophrys fotis). 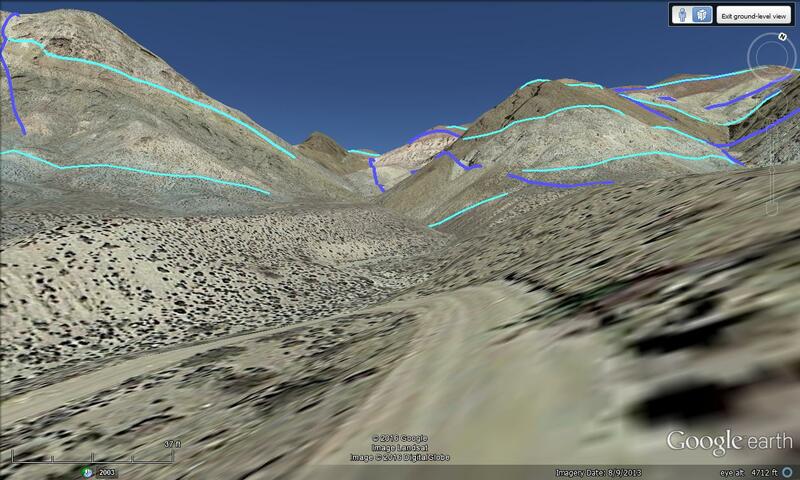 Google Earth image of the Grapevine Mountains with a few labels. Location of White Pass and other key localities, courtesy USGS TNM 2.0 Viewer. Labeling done in MS Paint. White Pass will mark another official milestone on our journey: We will enter the realm of this fairly detailed geologic map. Yay! Between Tan Mountain and White Pass, the road runs south of several smallish dark brown hills composed of brown volcanic rock above white to pale yellow sedimentary rocks, often tuffacaceous, with intercalated tuffs. 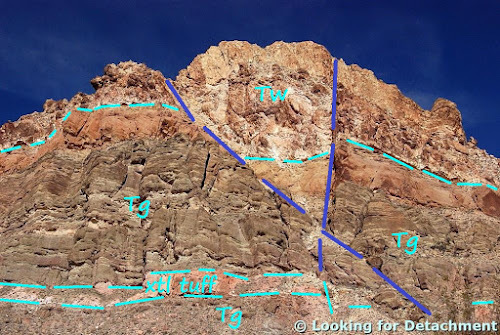 The brown, hill-capping formation has been mapped as Tlt, Lithic Ridge Tuff and related felsic rocks, by Workman et al (2002) and as part of Tw, the newly defined Wahguyhe Formation, by Niemi (2012). So it's a little confusing, but with a little research I determined that these brownish cliffs are indeed what has been called a latite flow before (Lengner and Troxel, 2008), with Niemi saying that the latite (he included it in the Wahguyhe) correlates with the Rhyolite of Picture Rock, which is rhyodacitic to latitic. 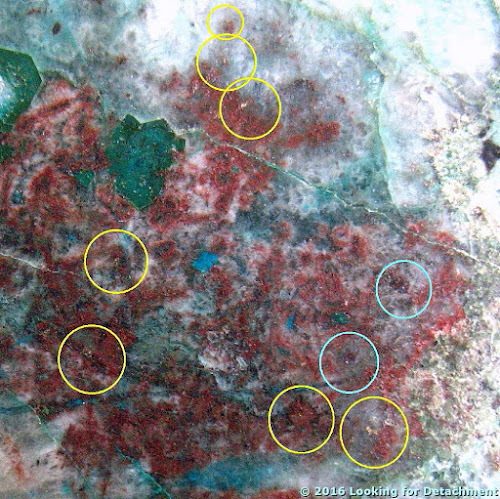 So, when you look north at the dark brown caps, think rhyodacite to latite! Dark brown latite flow rock caps a hill north of the road. 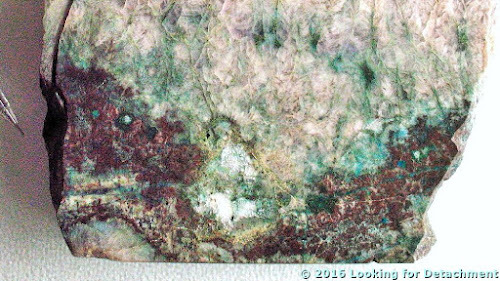 I took this zoomed-in photo mostly because of the interesting patterns in the talus coming from our dark brown latite flow on the right (and, the sky!). Moving on, we arrive at White Pass, where we can now see into the northeasternmost part of Titanothere Canyon. We're looking west from White Pass. The dark rocks to the left (S) are Cambrian; the rocks to the right (north) and straight ahead (W) are Tertiary. At White Pass, and in fact all along the road from about a mile past Tan Mountain, rocks to the south are all Cambrian while rocks to the north are all Tertiary. The same photo, labeled with geologic formations (the Tertiary as shown is all from Niemi, 2012). We'll see more of the Cambrian in a bit. The Tg is the Panuga Formation. 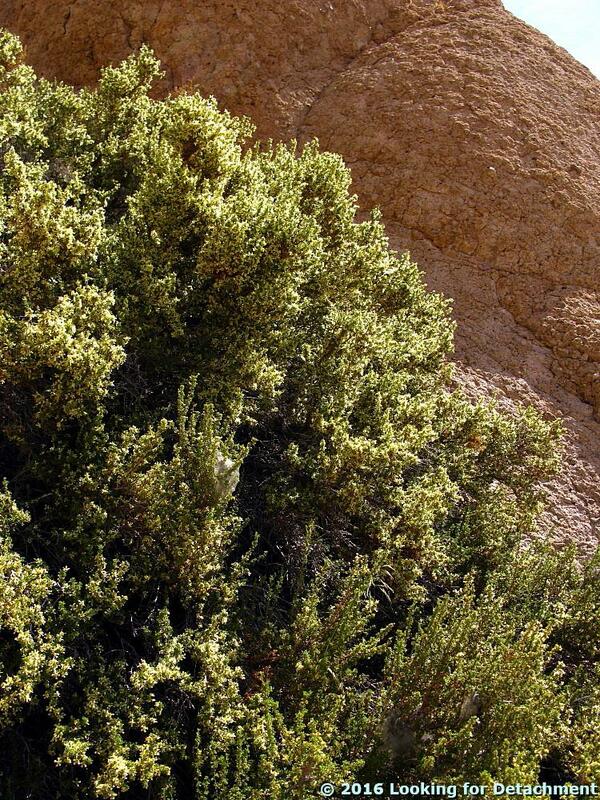 Probably some of you will notice that this greenish unit has been included in the Titus Canyon Formation before. We'll see more of this unit on the way to Red Pass, and maybe we'll figure out whether it's Titus Canyon Formation or not. 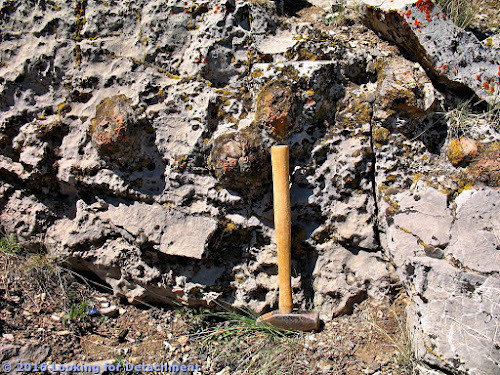 The Wahguyhe Formation (Tw) includes various sedimentary and volcanic units, including sandstone, shale, conglomerate, and tuffs. 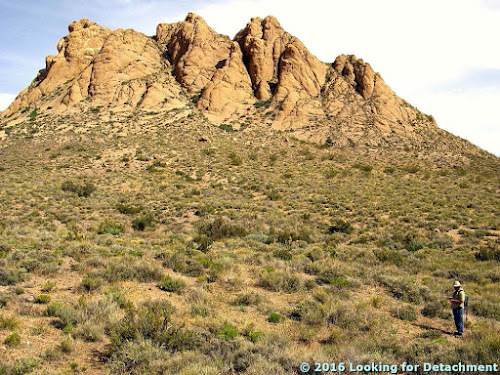 In places, the Trp, Rhyolite of Picture Rock, often described as a latite flow, is included in Tw. Here I've broken it out as best as I can (and hopefully, correctly!). Overlying the Tw and Trp are various tuffs, mostly ash-flow sheets from the southwest Nevada volcanic field, including those in the Crater Flat Group (Tc), the Paintbrush Group (Tp), and the Timber Mountain Group (Tm, not shown in these photos). All these Tertiary formations are Miocene in age (Niemi, 2012). Before leaving White Pass, we'll look off a little to the south. These two photos were taken about 7 years apart from almost the same spot. The lighting and clouds are a bit different, the time of day is nearly the same. Photo taken at about 10:00 am in late February, 2016. Photo taken at about 10:30 am in early May, 2009. I guess I'm often inspired by the same rocks and the same angles! 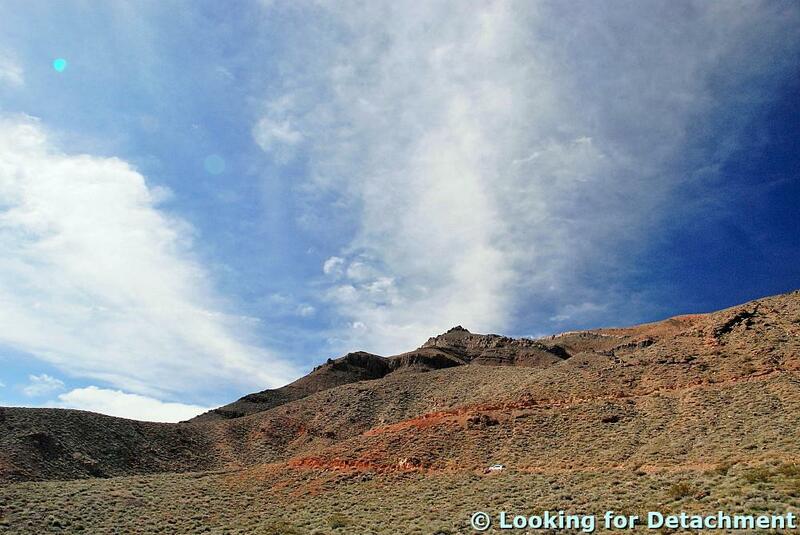 The photos both show Thimble Peak (6,381 ft, 1945 m), the thimble-shaped peak on the far left. 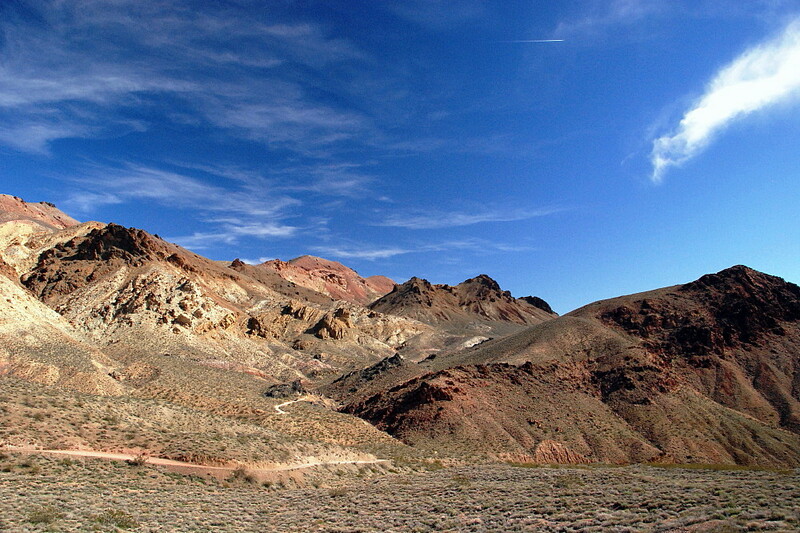 The dark gray rocks in the foreground on the left are in the Bonanza King Formation; the dark reddish brown rocks in the foreground, center and right (in shadow in the 2nd photo), consist, I think, of the Zabriskie Quartzite; and the layered rocks in the distance consist of the Bonanza King Formation (the gray on Thimble Peak and the dark gray capping the ridge to the right of Thimble Peak) overlying the brown, reddish brown, and gray Carrara Formation. 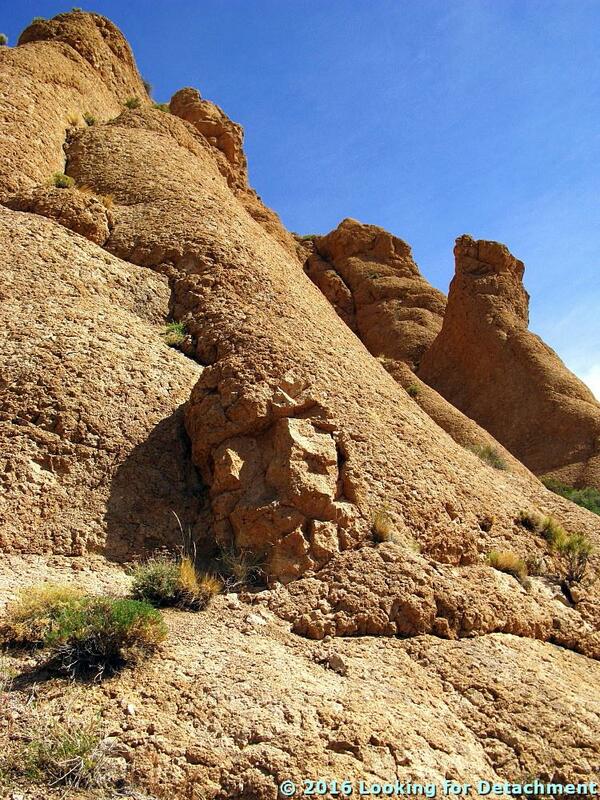 These formations are all Cambrian in age. The normal sequence is Zabriskie overlain by Carrara overlain by Bonanza King. 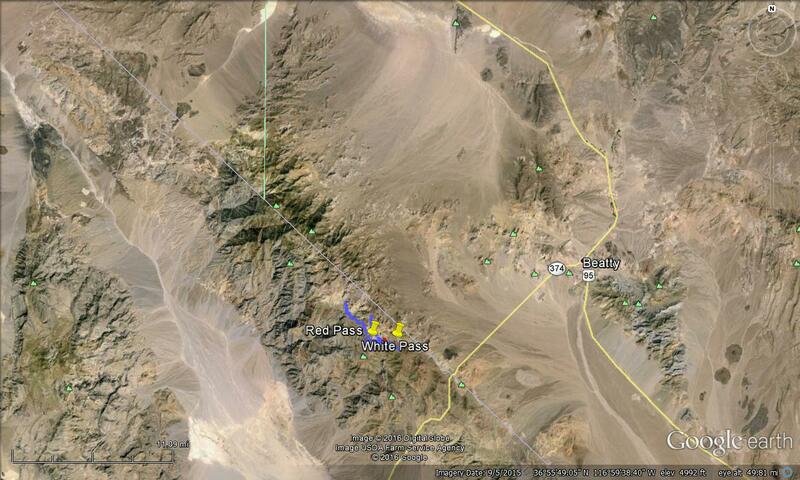 On Google Earth, it looks like the Bonanza King and Zabriskie in the foreground are juxtaposed by a fault. Here's another place I always end up stopping: on the road between White Pass and an unnamed pass between the two branches of upper Titanothere Canyon. We'll turn and look south down Titanothere Canyon. The alluvial fan in the distance is across Death Valley, beyond Stovepipe Wells. At about the same point on the road, also looking to the south,you'll see Telescope Peak. 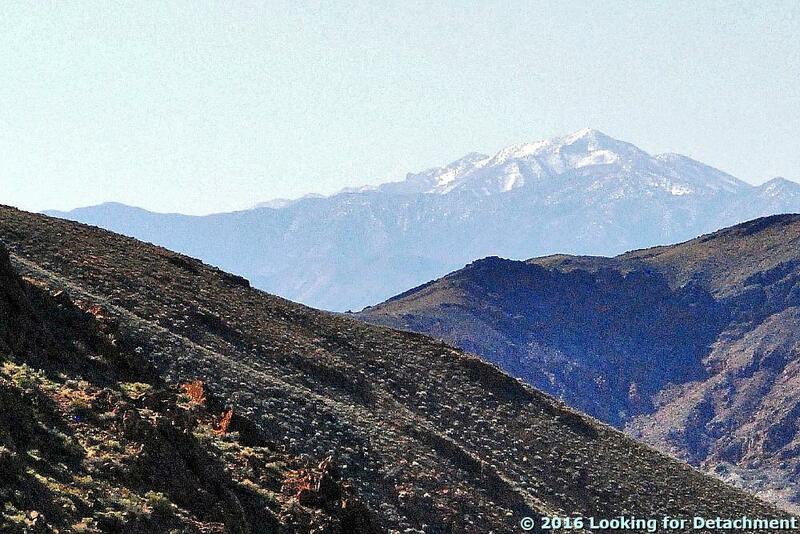 Telescope Peak (11,048 ft, 3367 m) is about 45 miles distant in this shot! Next time, maybe we'll make it to Red Pass! 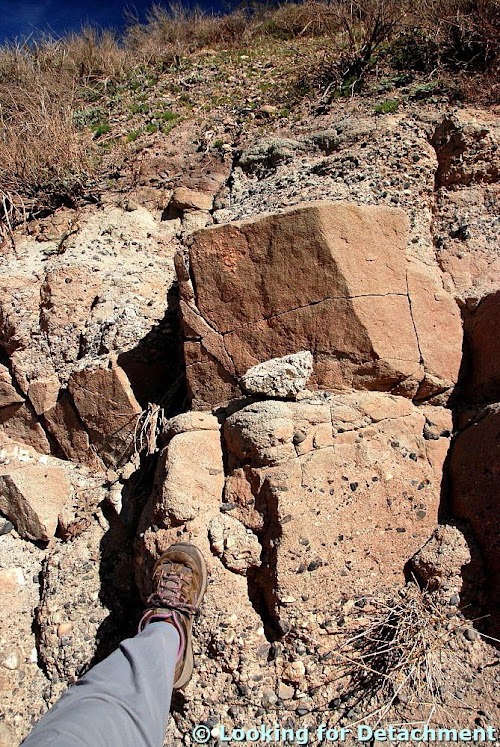 Back in my eastern Nevada field days, I was lucky enough to go on a stratigraphy tour that took me to several good examples of chert nodules in the mostly Pennsylvanian Ely Limestone. 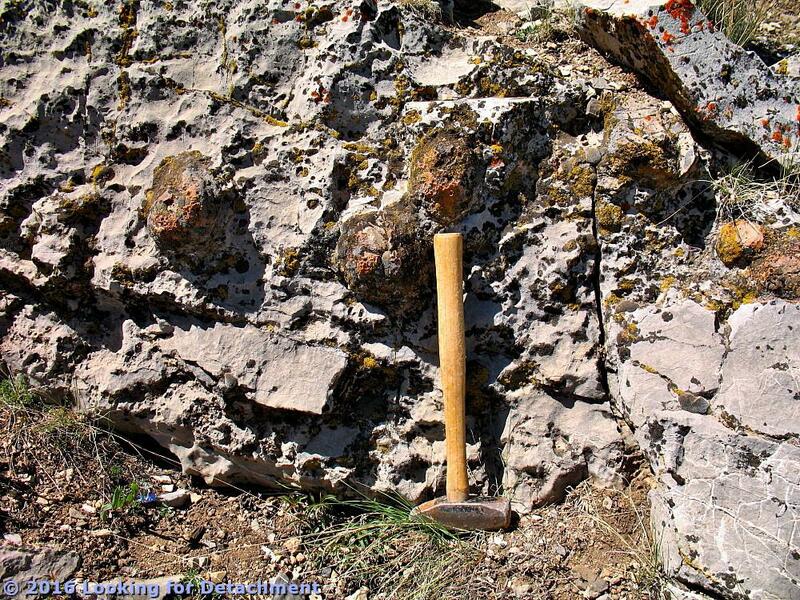 Nicely spherical chert nodules in the Ely Limestone, with 2.5 lb sledge for scale. In the 1950s and 1960s, R. A. Breitrick and J. E. Welsh described the detailed stratigraphy of the Ely Limestone in the area of Ely and the Robinson mining district (with Breitrick, at least, continuing to work in the area to this day). They divided the formation into mappable units, W through C, bottom to top. (Their units A and B have since been placed in the overlying Permian Riepe Spring Limestone.) The only summary of this stratigraphy I could find online is shown here (Maher, 1995, p. 22). Several units within the Ely, notably units S, R, P, L, and F, contain cannonball cherts (although I'm not sure about the details of units T, U, V, and W: I can't find my field sheets in the mess my office is currently in!). Theses photos are most likely from S, R, or P (my thoughts). 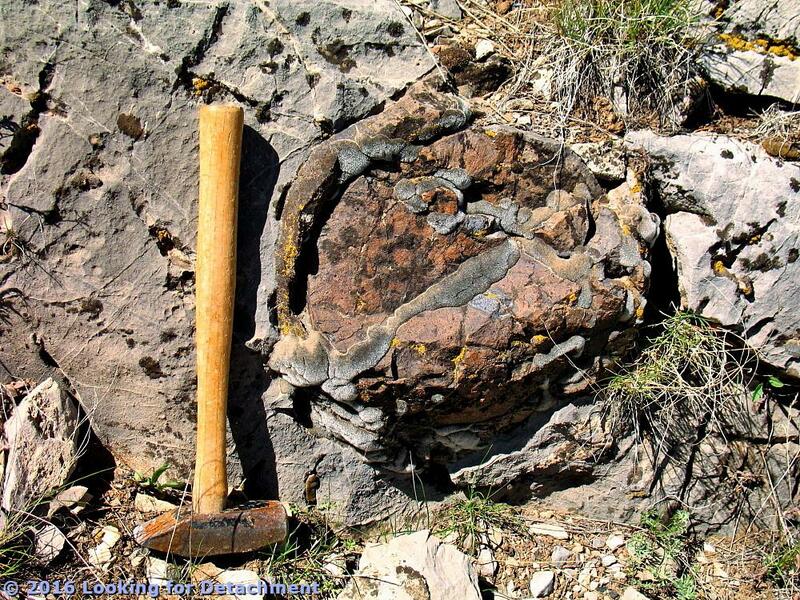 Fairly large, sub-spherical chert nodule. This is the best example I have of a chert nodule that is approaching "cannonball" in size and shape. 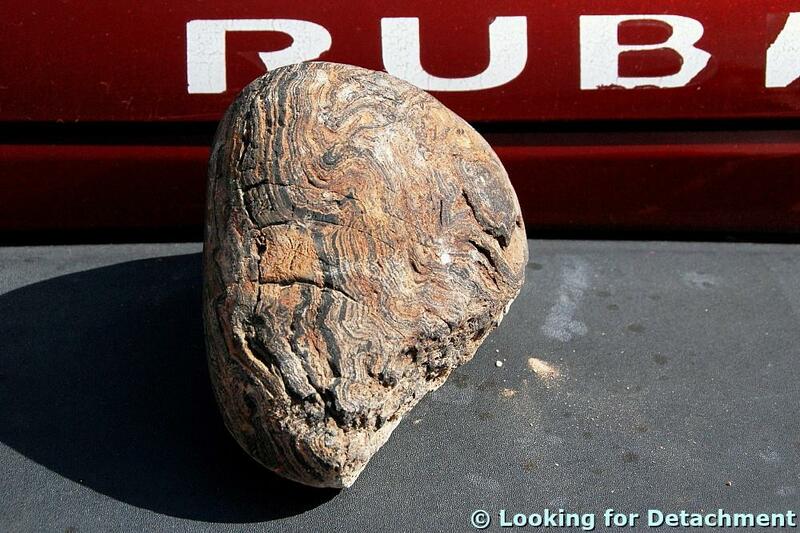 Apparently, cannonball chert nodules can weather out and end up looking a lot like loose cannonballs. An excellent example of a loose cannonball nodule can be seen here on page 27 (Maher, 1995, Fig. 7C). 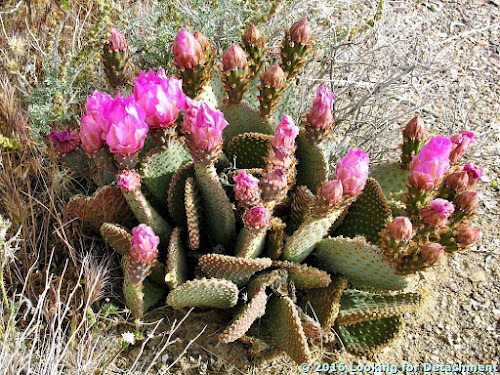 These photos were taken in the spring of 2007 on the northeastern slopes of Rib Hill, a location that might or might not be accessible from Highway 50 or Route 6 via a side road formerly known as S.R. 44 or S.R. 485 (the location might be behind a locked gate). 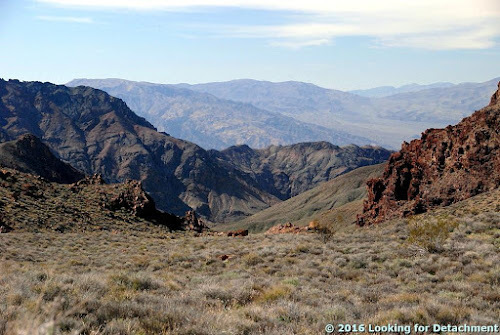 On our ongoing journey into Death Valley via Titus Canyon, we've left behind the Original Bullfrog mine (which can be seen from the road if you know where to look) and have made it past the eastern boundary of Death Valley National Park. 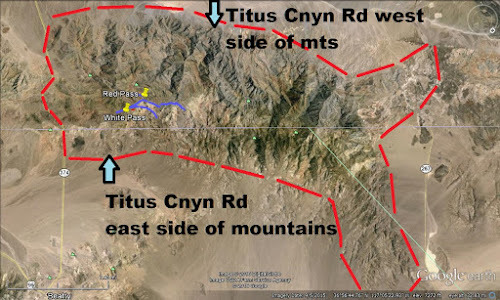 As I've already mentioned, the Titus Canyon road can be distractingly washboardy in its early parts, and it's often barely wide enough for two vehicles to squeeze past each other, which only happens when a faster one wants to pass a slower one (it’s all one-way to the west). 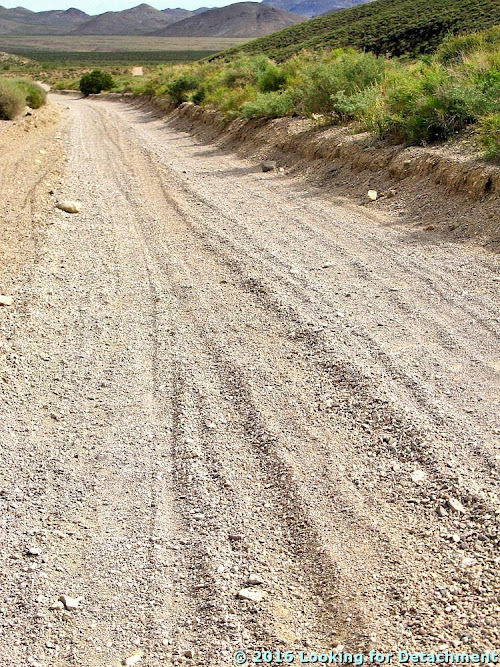 Loose gravel typical of the Titus Canyon road east of Tan Mountain. 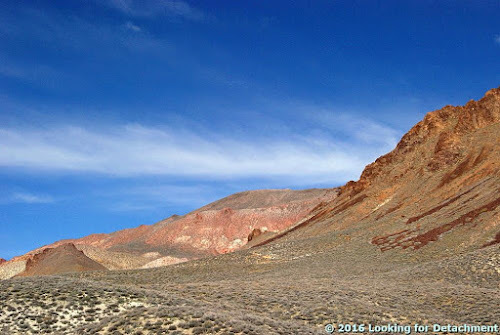 In the photo, we're looking back the way we just came, which happens to be northward here, toward some low volcanic hills in the northwesternmost part of the Amargosa Desert. By the way, I took all the photos in this post in early May, 2009. 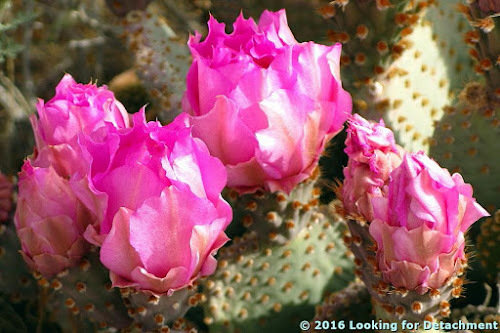 A lot of flowers were blooming in the upper Amargosa Desert and along the Titus Canyon road. We stopped often on that trip, for flowers, lizards, and short hikes. 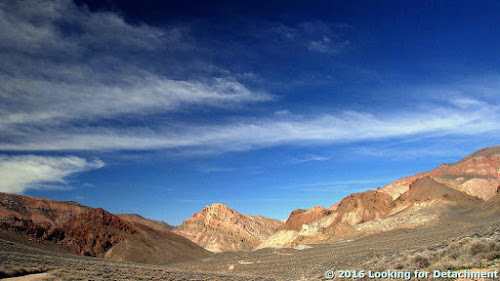 We didn’t stop as often during our February trip to Death Valley: We were intent on getting to the lower elevations to see the superbloom. 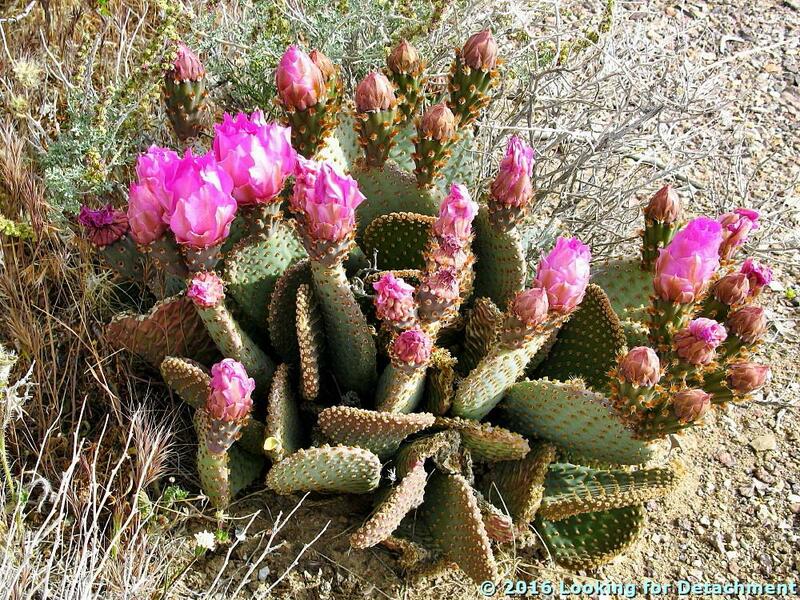 Prickly pear cactus, which we saw along the road before entering the park (see location map way below). 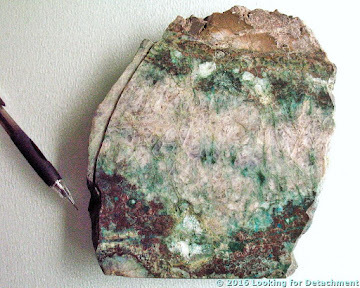 The cross-hatching pattern of the pads reminds me of the mineral alunite. 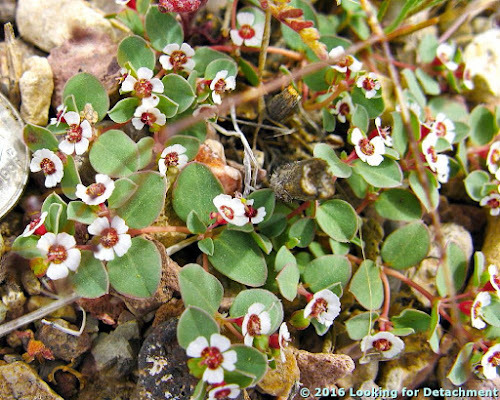 A close-up of the same plant. An unidentified flowering plant with 1996 dime on the left for scale. 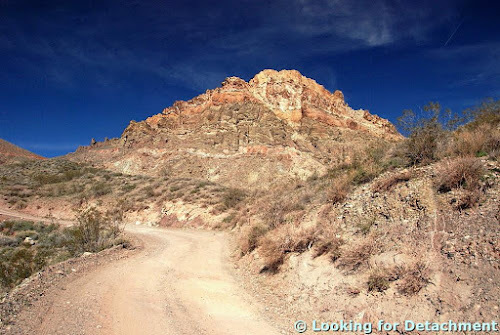 After about 50 minutes on the road, and about a half hour into the park (including flower-photo stops), MOH and I pulled over at a hill composed of exposed and outcropping ash-flow tuff. 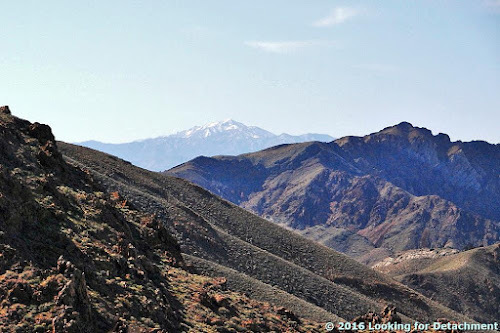 I found out later that this hill or butte is locally or colloquially known as “Tan Mountain.” It’s referred to by this name on Panoramio and in Death Valley's Titus Canyon & Leadfield Ghost Town by Lengner and Troxel (2002, 2008). The reason for the name is ... you guessed it, the color. It is not named on topo maps, and ordinarily, without knowing a local name, I'd call it hill 4915, for the 4915-foot marking shown on the Daylight Pass 7.5' quad (USGS TNM 2.0 location). The road is widened somewhat at Tan Mountain, so it's easy to stop, look around, and go for a stroll. It can seem kind of warm on the slopes, even before ten in the morning; maybe the light-colored tuff reflects a lot of heat. Tan Mountain, with geo-type hiker for scale. We continued to take flower photos as we rambled upward. 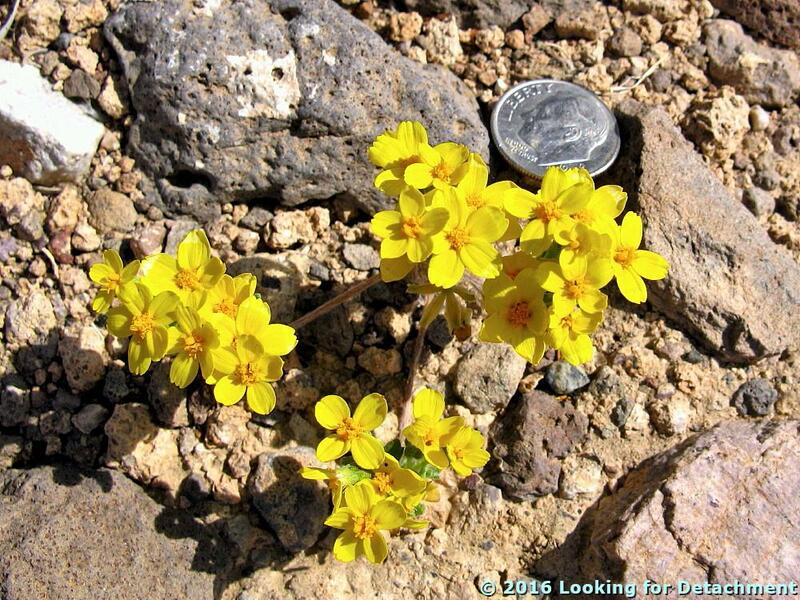 An unknown yellow flowering plant with dime for scale. 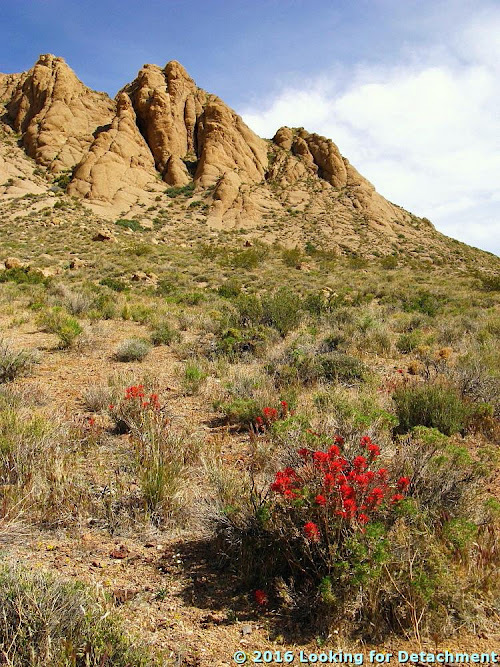 Bright red fireweed on the slopes below the rounded spires and hoodoos of Tan Mountain. Nearing the base of the cliffs, I stopped to take this photo of an outcrop of the pumiceous, lithic-rich, poorly welded ash-flow tuff that makes up Tan Mountain. I didn't climb to the top of the hill, so I didn't get to see if the degree of welding changed significantly in the 200 feet or so to the top. A reddish brown lithic fragment in the poorly welded tuff. Tent-like and hoodoo-like forms eroded into the ash-flow tuff. 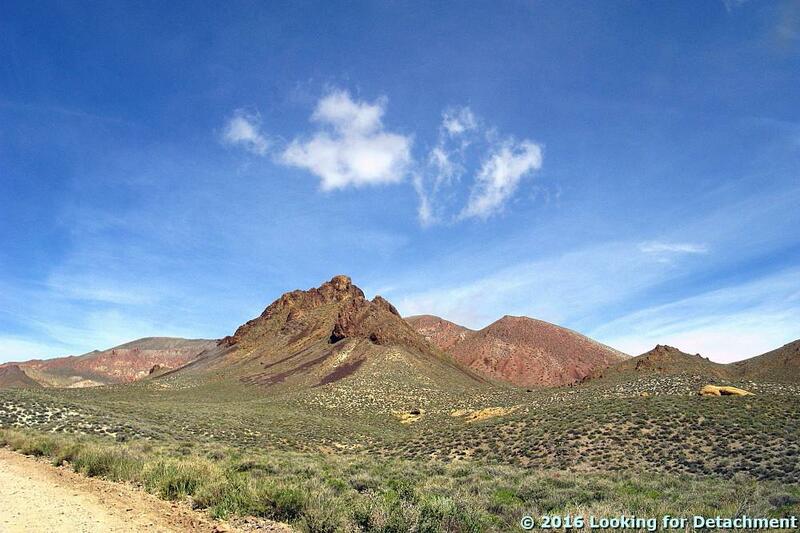 "...you will see volcanic debris only from the Timber Mountain caldera on this trip." And that's how far we're going down the Titus Canyon road today. 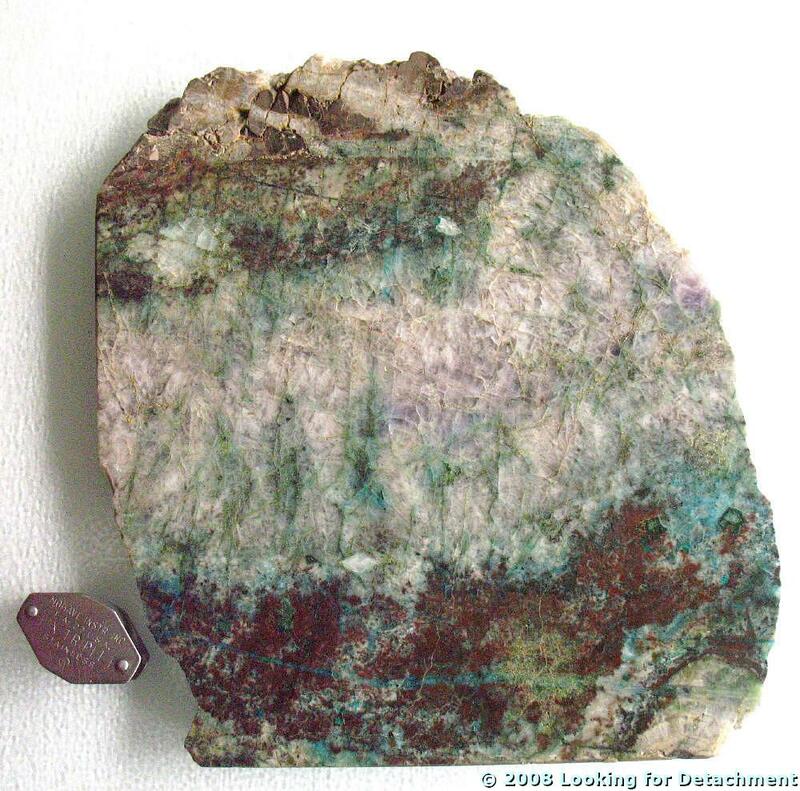 I collected this hand sample from the Original Bullfrog mine, Nye County, Nevada, sometime back in the mid to late 1980s when doing recon in the area, then cut and polished it—probably with a company saw and grinding wheel. This specimen is no doubt the best one I still have (a few may have been lost during one or two house moves), although it's been a while since I looked through all my rock boxes. This one photo has already been featured in two earlier posts, here and here. I've got a few more photos to show you. These zoom in so we can see the size of the shiny ore minerals contained within the rock: v.g. (visible gold) and a silvery-gray silver mineral. Here's the other side of this same rock. We'll be focusing in on the lower left. I've zoomed in here. Can you see the shiny flecks? 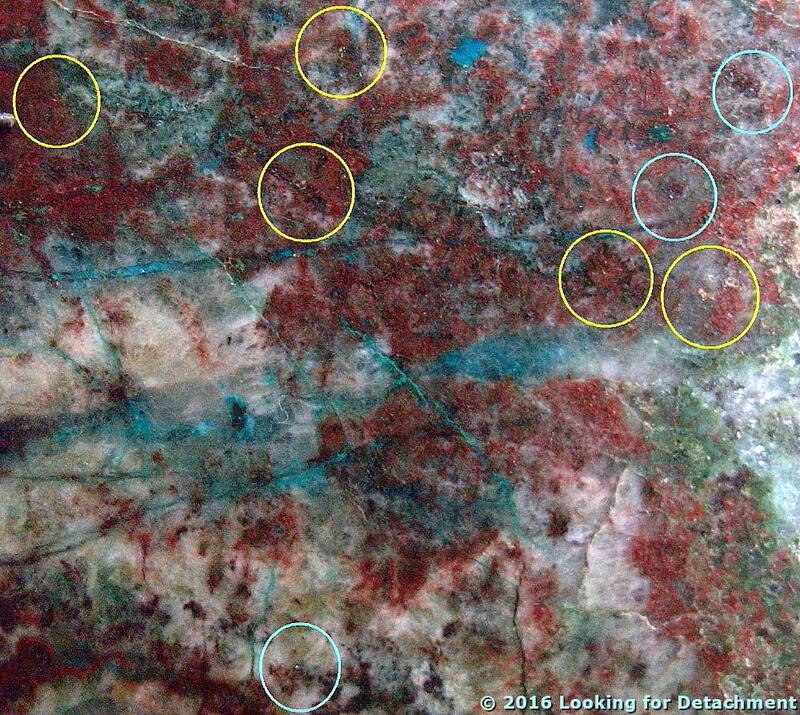 Well, it's hard to see them without holding the rock up to the light and waving it back and forth to get the metallic glint, so I've circled the little bits in yellow and light blue (cyan). Yellow is for gold; cyan is for silver. Yes, these are very tiny flecks of native gold and a silver mineral. The silver mineral is probably either acanthite; Ag-bearing tetrahedrite, with Ag substituting for Cu in the solid-solution series with freibergite; or uytenbogaardtite. Zooming in even farther, we can see the ore minerals without enlarging the photo. A few of these show up really well. Next time I get my hands on this sample—I think it's still up in Alaska—I'll see if I can get even better photos.